Publishers Weekly Magazine's Front Cover Features A Young Adult Fiction Novel Titled "Entangled In Freedom: A Civil War Story"
Publishers Weekly Magazine's March 28th front cover features a young adult fiction novel titled "Entangled In Freedom: A Civil War Story" by Ann DeWitt and Kevin M. Weeks. African Americans wore the grey as well as the blue, here is a window onto their story. Publishers Weekly and Independent Book Publishers Association (IBPA) selected "Entangled In Freedom: A Civil War Story" from more than 45 entries for the front cover of Publishers Weekly magazine's March 28th Special Independent Publishers Spring Announcement Issue. Being featured is indeed an honor as the United States dawns upon the sesquicentennial of the American Civil War beginning April 12th. Retaining the interest of students is paramount during the 150th Anniversary of the American Civil War (April 2011 to April 2015). 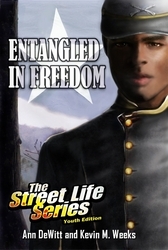 "Entangled In Freedom: A Civil War Story" is a young adult fiction novel which chronicles 22 year old Isaac's journey through the dirt streets of Oxford (Georgia), Big Shanty (Georgia) and on over to Cumberland Gap (Tennessee) as he serves with his slaveholder and the 42nd Regiment Georgia Volunteers. Decades after Daniel Boone blazed the Wilderness Trail, readers witness how Isaac is front and center as the Confederate and Union armies skirmish for strategic supply lines required for outlying Civil War battle campaigns. Thus, "Entangled In Freedom: A Civil War Story" is written in first person narrative to demonstrate Isaac's perception of Civil War historical events. The US Review of Books states, "...The sharp edges of class and race and roles allowable ring through the pages like the loud echoes of the same do today. African Americans wore the grey as well as the blue, here is a window onto their story. Self-interest, altruism, compulsion, even the struggle for respect: these are some of the motives slaves might have had to defend the institution that enslaved them. They are also American motivations, ones we all can taste. Taste them we do, in this grand, yet simple, story..."
The entire book review is listed on The US Review of Books website. For research information with URL links to primary sources about African-Americans who served in various capacities with the Confederate States Army, visit http://www.blackconfederatesoldiers.com. For several years, IBPA has partnered with Publishers Weekly to highlight titles published by the independent publishing community. Publishers Weekly is the most powerful publication serving all segments involved in the creation, production, marketing and sale of the written word in book, audio, video and electronic formats for over 136 years. Founded in 1983, IBPA is a trade association of independent publishers with the mission to advance the professional interests of independent publishers. First time novelist Ann DeWitt, a native of South Carolina, teams with veteran author Kevin M. Weeks, a native of Philadelphia, to fuse their southern and northern perspectives on why some African Americans served with the Confederacy during the American Civil War. For "Entangled In Freedom: A Civil War Story," both authors are recipients of the Bonnie Blue Society Award; and the novel is now cataloged in the Major General William D. McCain Library at the Sons of Confederate Veterans International Headquarters in Columbia, Tennessee. In addition, Kevin M. Weeks has penned crime fiction and urban fiction novels for which he received an African-American Pavilion at BookExpo America 2009 Urban Book Series of the Year Award as well as numerous book festival awards. Both authors reside in Atlanta, Georgia. For more information, visit http://www.entangledinfreedom.com.